The lustrous dainty Pearls are all individually post Set. The Cubic Zircon as bud design is quite nice between the Pearls. Stunning Cute round circle of cream Pearls are embellished by sparkling cubic zircon buds all over with silver stem. 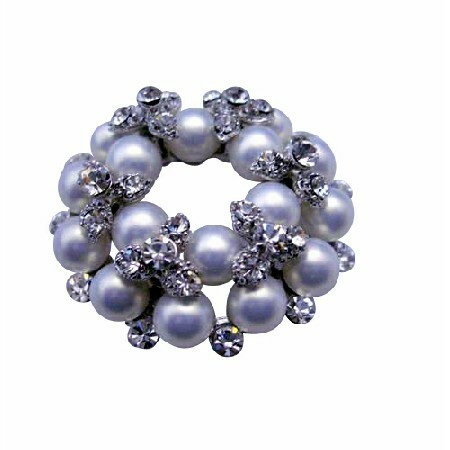 Pretty & feminine describes this vintage Brooch with Good quality of Pearls & Cubic Zircon Glorious/Fabulous Pin Brooch brilliant & excellent crafted Very Elegant Dainty & Sleek! An absolutely gorgeous vintage brooch. Give every ensemble a feminine touch with this beautiful brooch. Add a dash of drama with a bold eye-catching brooch. The brooch is beautiful crafted & authenticated attaches securely with pin clasp. Picture this lovely brooch on your favorite dress shirt scarf or jacket lapel. A beautiful accessory for any occasion. Secures with a standard pin clasp. A great gift idea or an addition to your jewel collection.